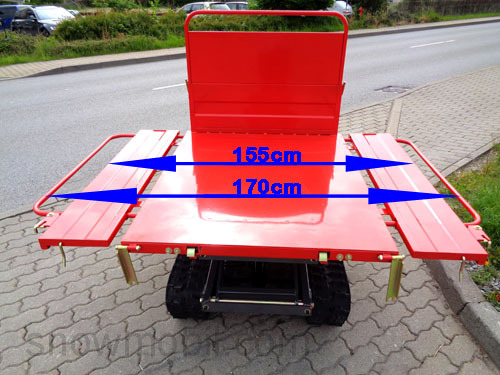 5.490,00 EUR 19 % VAT incl. 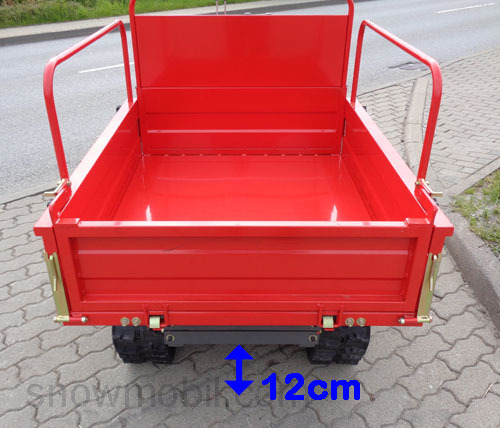 With pickup you save 175 €! 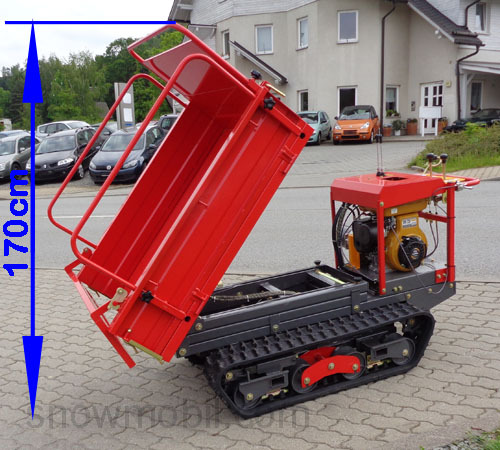 90% of all crawler type dumpers worldwide are produced in Japan. There are about 5 major manufacturers. 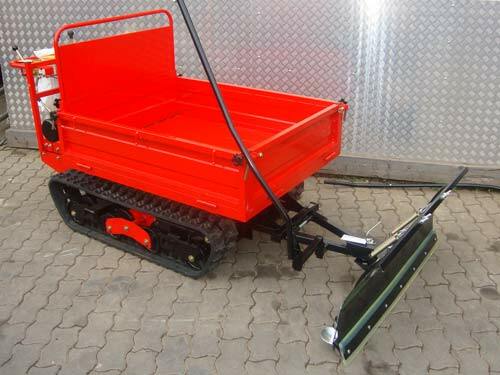 This manufacturer manufactures only crawler dumpers / powered wheelbarrows in various designs, which are exported worldwide. In almost every country in Europe, there are branches. We have selected 4 units from the range of 15 variants (which are available on the market), which are suitable for the sophisticated private and professional use. The Japanese have the longest experience - a very great need in their own country. 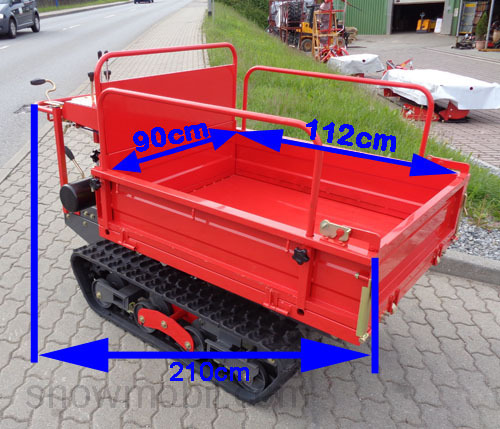 Japan is divided by a large mountain range, thus there is a great need in this region for tracked vehicles. But even in the muddy rice fields, these devices are used. The Japanese set for each work a technique. The end-impeller is made of gray cast iron. The drive wheel is made of gray cast iron. 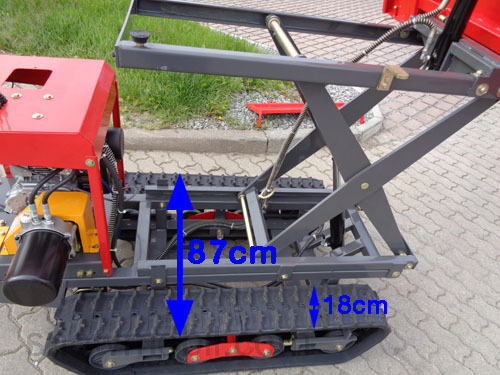 The rollers are not made of thin sheet metal, but made ​​of sturdy material. As implement at surcharge, we are still providing a snow plow. 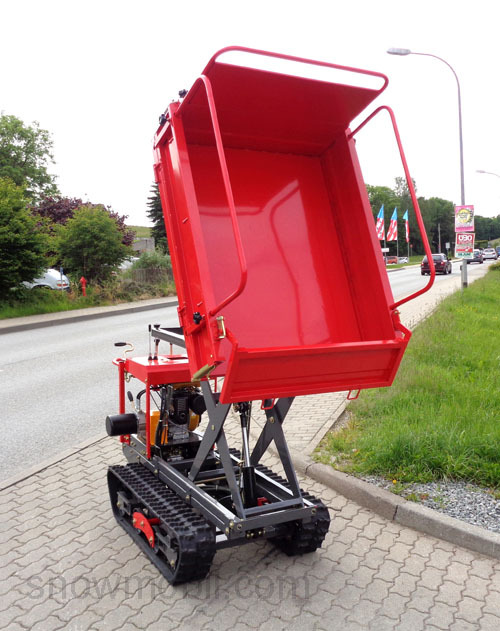 The dumper can be used as a universal device in the forestry and agriculture, private land, and in landscaping and construction. The 8.5 PS Robin engine is at a maximum speed of 2000rpm. sufficient. 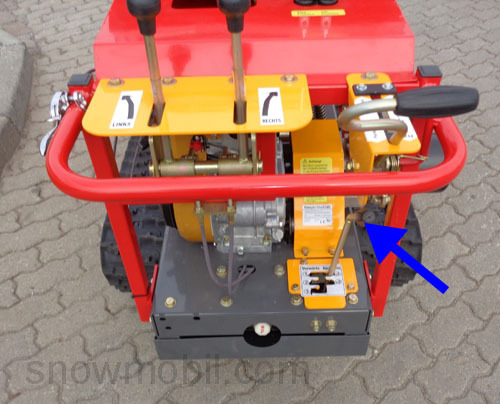 The gear reduction is designed to be very effortless. Even when tilting the skip or with full load the engine is not at full blast. The Robin engine is performed standing, i.e. 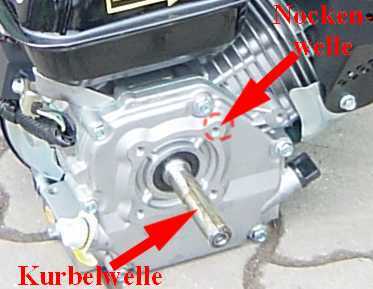 the piston and cylinder are vertical. 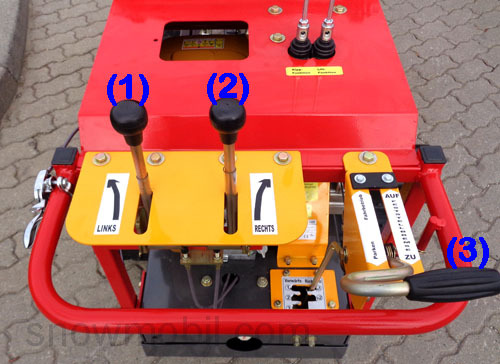 Thus, it can not come to engine damage on a steep slope because the oil is in the stationary crankcase and is thus thrown in all parts of the engine by the crankshaft. The possibility of piston seizures and crankshaft damages are prevented. Assuming the engine oil level is correct. 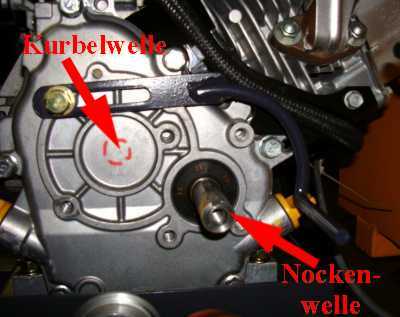 The possibility of oil deficiency and piston seizures at the top of the piston is much more likely in case of horizontal engines. 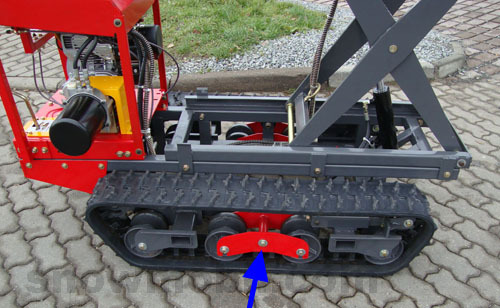 Very important: The lower the track contact surface is, the faster the unit can tilt in sloping terrain! 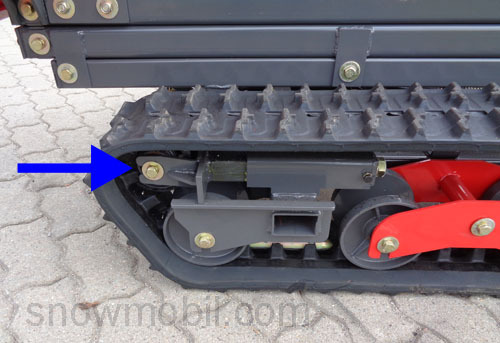 The two rollers are connected movable to compensate obstacles. 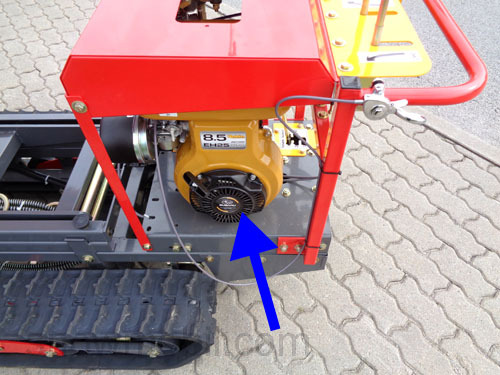 This engine is not installed in our dumper. Here is a standard engine in which the power transmission is transmitted from the crankshaft. 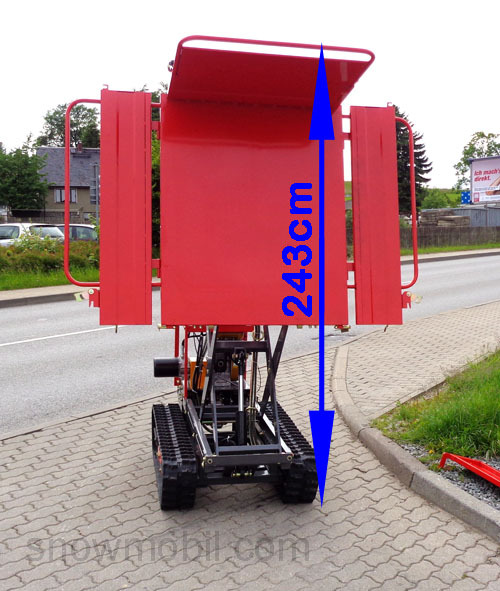 You'll need a high cubic capacity and high speed of rotation to get to the desired performance. The force is taken from the cam shaft. The camshaft makes half the speed as the crankshaft. Thus, this engine needs a slower speed and a lower cubic capacity to deliver the same power at the end, but the torque is much higher. 6,25 kW/8,5 PS max. engine power at 2000 rpm. 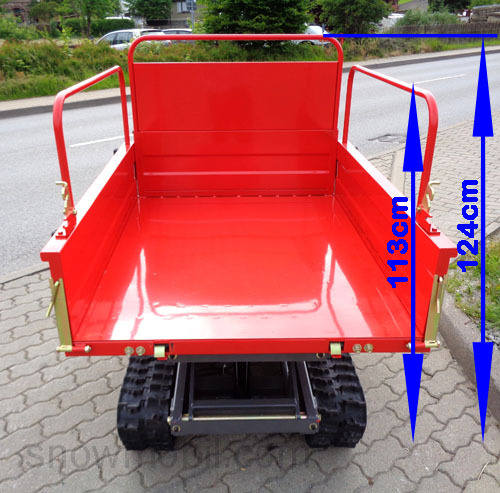 As a result of the additionally attached two brackets at the end the rear panel, it pushes the other panels not apart. 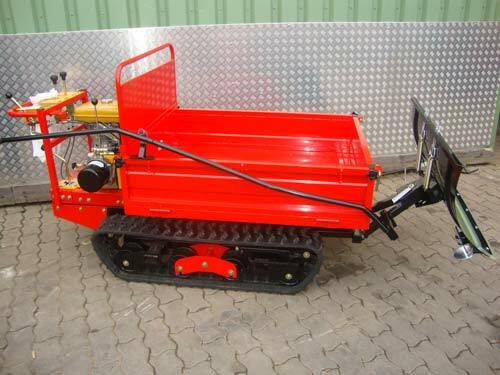 That dumper is ideal to carry timber too. 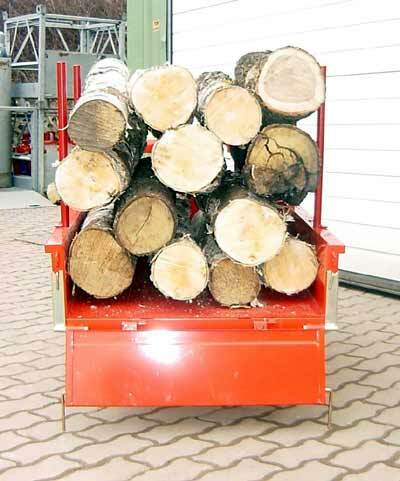 Iron pipes can be plugged into the side walls (tubular frames) of the dumper, thus wood can be stacked easily. 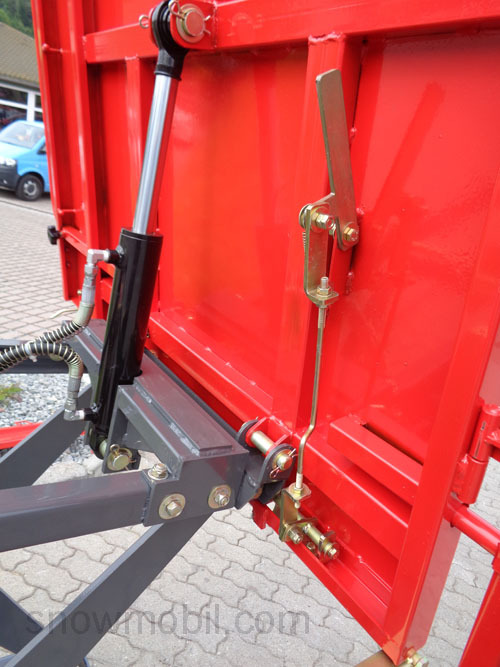 As to the front rear panel must be removed, it is believed that the wood presses the two side panels apart by the weight of the wood, but so there are the brackets. 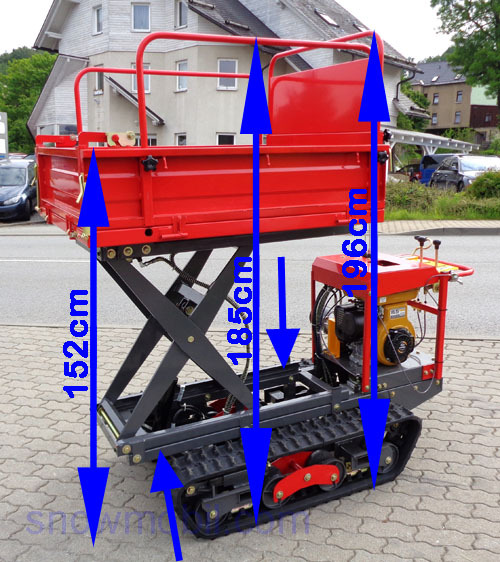 The lift can be continuously moved to any height. 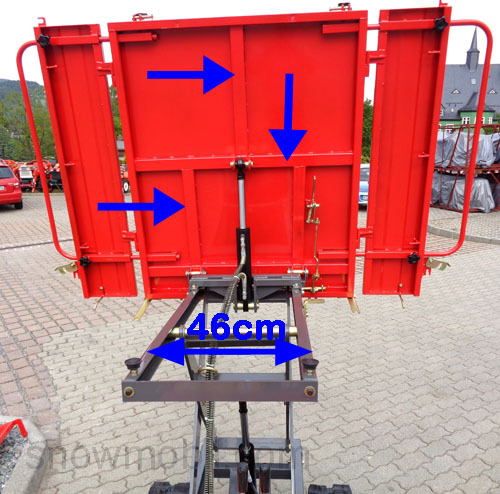 At any height it can also be tilted the skip hydraulically. 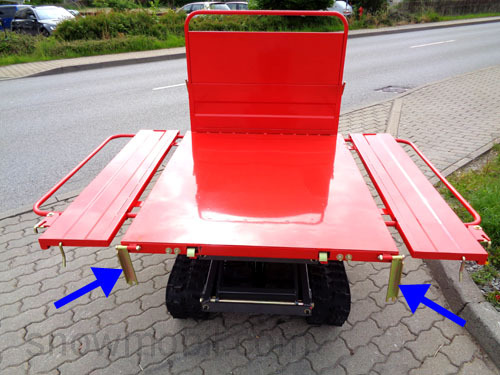 When the skip is tilted, a linkage automatically opens the bottom hinge of the tailgate and the tailgate opens and folds forwards. 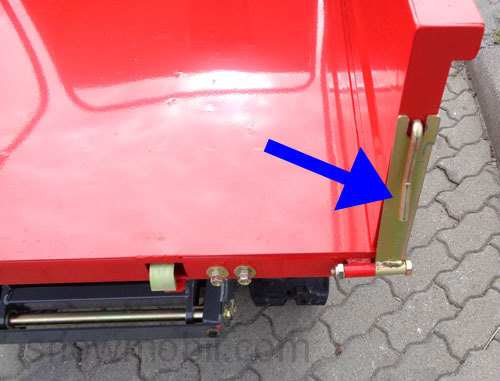 When the skip is returned to its initial position, the tailgate closes automatically and locks. 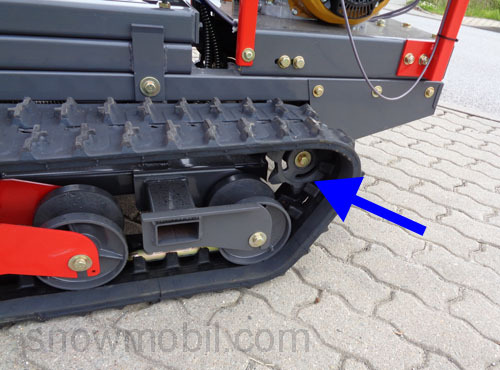 The snow plow is fitted with a included adapter. 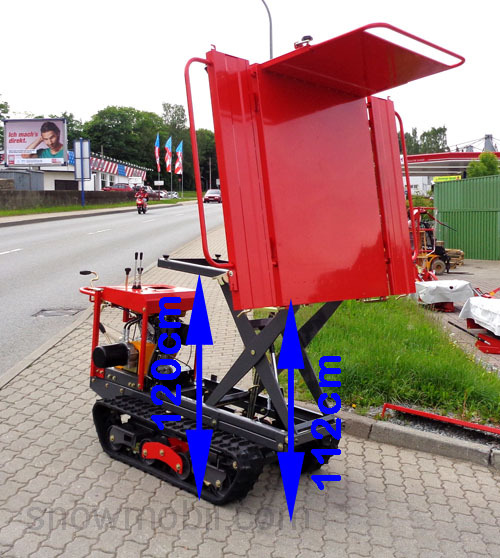 It is a spring flaps snow plow (which folds away when encountering an obstruction) with a height of 50 cm. It is equipped with a rubber scraping edge. 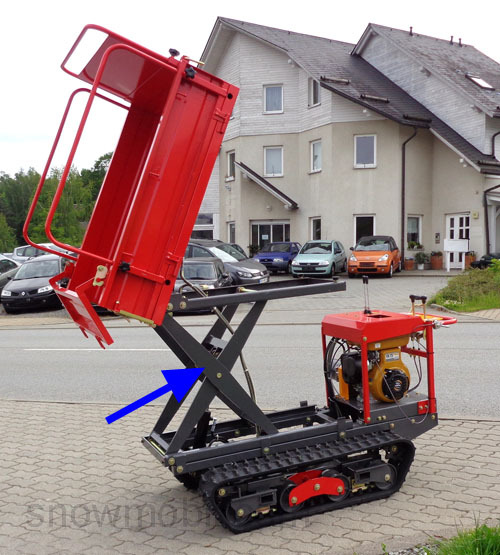 By means of spring plug it can be adjusted laterally and using the handlever the snow plow can be raised and lowered easily. 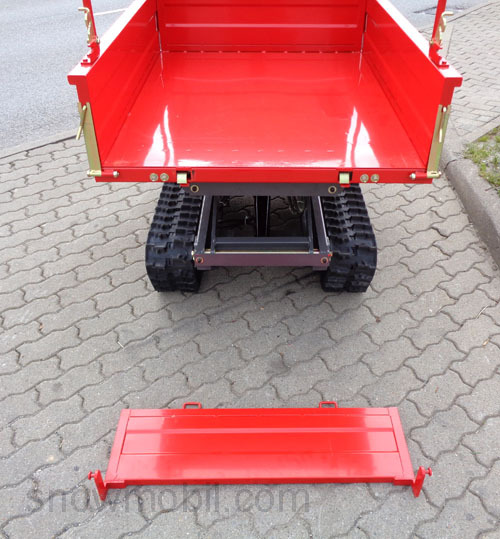 In the photos shown you can see the AM50L - the frame is for these AM50 series dumpers the same.